If you visit the official website of 365 Day Diet Pill, you will be impressed by their claims, the way customers are greeted, and how you will be encouraged to include these pills in your daily life. They promise that you will become not only slim, but also feel full of energy and liveliness with this great achievement, a realbreakthrough, in the field of diet pills, as they call it. They also point out how convenient and economical it is to buy one single bottle a year and get one pill every day, without worrying about buying a new bottle every month. We have to admit that manufactures really make a very good offer, and it is apparent that they do not try to make a big profit like so many other manufacturers that have flooded the market of diet products. At the amazing price of $79.99 per bottle in the US, or about £40 in the UK, the monthly cost is as low as $7, which is one of the lowest in the diet pill market. However, the question of value for money has to be answered. We will have to examine how cost effective this product is, and if it meets specific health and slimming requirements. 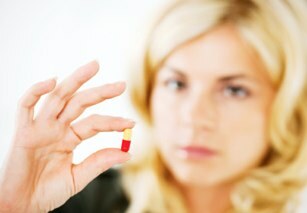 How Effective Is the 365 Diet Pill? First of all we should have a look at the 365 Day Diet Pill ingredients in comparison to its cost. The formula of this product, which is patent pending, applies the know-how of time release technology. This kind of technology, which is usually found in slimming patches, releases the active ingredients of a product slowly over time, and in such a way as to exclude the possibility of overdose. In the official site of the product, whose formula is a thermogenic fat burner, there is a list of the substances contained in it, but no quantities of each ingredient are mentioned. 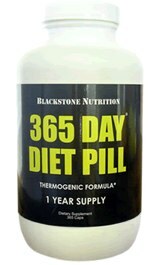 Neither could we find more details or a good explanation on how the 365 Day Diet Pill functions against excess fat. So, having a closer look at the composition of this product reveals that it contains some really “trendy” ingredients such as Cha de Burge and Green Tea, which can be found in plenty of slimming products or diet supplements on the market. However, all these cannot be regarded as a “breakthrough” in the fat burning field. Judging from its active ingredients, we can say that these pills cannot possibly have any kind of serious side effects, but have in mind that all fat burning products may cause insomnia, irritability or agitation. The greatest advantage of those pills is their price, which makes them one of the most cost-competitive products on the market today. The fact that the product lacks in accreditation, that its scientific background is not known, and that it hasn’t been clinically tested are its weak points. But don’t think that it’s the only product on the market with these drawbacks, as the 72 Hour Diet Pill has exactly the same characteristics and the same negative points. For all the above-mentioned drawbacks, purchasing the product is not recommended. Furthermore, the most important thing when buying a product is customer support, and their official website does not seem to provide any kind of such support. Apart from an email address there is no other contact detail and we cannot be sure if emails are promptly answered or not. Most people prefer the official website of the product, but you can also buy it on eBay. Please note that when making online purchases, you should make sure that you can contact the company which sells the products you want to buy. If you see that contact is difficult or non-existent, then you’d better not buy anything at all. For those wishing to lose weight, fat blockers or fat binding substances are recognized to be more effective than fat burning ones. If you are severely overweight, that is your Body Mass Index (BMI) is a lot higher than normal, and you are entitled to a prescription, then Xenical could be the best solution for your case.